The KODAK POINT-OF-CARE CR 140 System is ideal for computed radiography examinations in busy clinics and specialty practices. Recommended for satellite locations such as military field installations, CR 140 provides big value. Durable, compact, and lightweight, CR 140 enables all imaging functions to be performed at the point of patient care with one affordable package featuring: the single-plate CR reader, KODAK flexible phosphor screens, advanced image management software, and a PC-based review station. 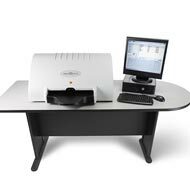 Highly versatile - The Kodak Point-of-Care CR 140 System is part of a modular solution that can be configured to meet most clinical applications. Its Kodak Quality Control Scanner interface lets you set up the system to capture high-quality x-ray images of any body part with minimal steps for scanning, processing, and image quality assurance. All imaging parameters are optimized, resulting in digital images that can be enhanced, enlarged, duplicated, and sent to any location in seconds as a DICOM 3.0 file with no loss of resolution. Images also can be printed or archived locally on CDs or DVDs. Point-of-care productivity - Mounted on an optional wheeled Z-cart or placed on a tabletop, the Kodak Point-of-Care CR 140 System can be used in virtually any location. With the Z-cart, this system can be rolled into any situation where nearly instant digital images are needed. Military applications - Deployed by military forces worldwide, the field-proven Kodak Pointof- Care CR 140 System is ideal for remote locations. Its durable design can withstand rough handling, temperature and humidity extremes, and stresses of nature such as wind, sand, and moisture. Even in the most demanding conditions, this portable system is easy to set up and operate.